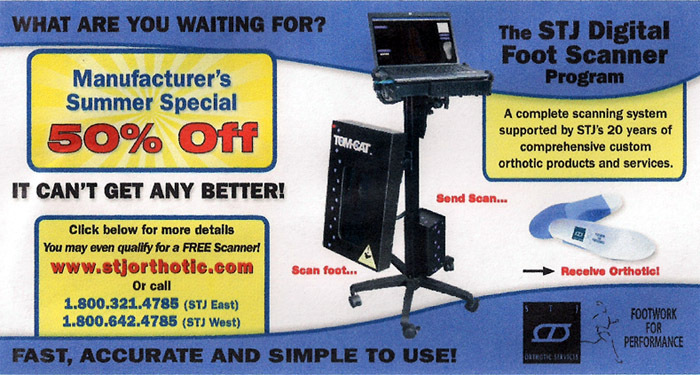 STJ has made it easier than ever to scan, order and deliver orthotics to your patients with our digital scanning system. It's fast, accurate and easy to use. Both custom footbeds are made from your negative cast impression of plaster or foam. The Custom Sandal footbed is computer matched to the contours of your negative mold. The Custom Orthotic Sandal is made traditionally from your negative mold with the choice of five different Orthotic devices from the STJ Custom Comprehensive Product line. All custom footbeds are removable and interchangeable with all of the sandal styles available. In-office displays including sandal samples and patient information brochures are available. STJ’s goal is to increase your treatment options and expand your practice. Please call STJ at 1-800-321-4STJ (4785) for pricing, Sandal Rx forms and further information. X-Trac OS mens whole sizes 7-16, womens 5-11. Supple, full-grain weatherproof leather uppers. Designed as a comfortable, casual sport sandal. Xtension OS : Mens whole sizes 7-16, Womens 5-11.
outsole unit ensuring a necessary stable environment for running. Granola mens whole sizes, 7-16, womens 5-11. Classic two strap slip-on. The ultimate open heel design for comfort & convenience with buckles for “set it and forget it” fit.